I was intrigued by this tale, a young lady didn’t often get the chance for adventure that Evelyn has with the Canada journey. 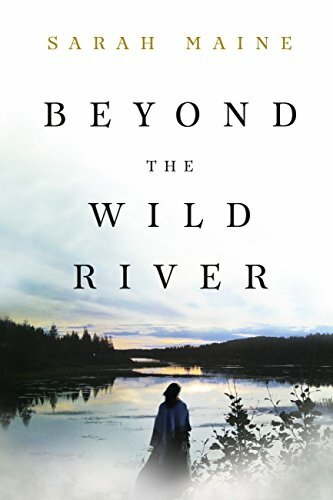 I really enjoyed the story, its beautifully written, felt very evocative of the time period and the wilderness of the lands. The philosophy that creeps in too, the unfairness of UK laws, where Ballantyre gets taken to task by a poacher of “his” salmon, the dichotomy of whether people can actually own salmon and other creatures just because they’re passing through their land. that could be taken further – who says land belongs to them….interesting points and fitted very well within the story as it unfolds. I liked the mix of people included, and the descriptions of the journey and the camps. I felt for James, from a child he’d been placed in an unfair situation, and life then was very much dependent on who you were when you were born. Corruption, bribery, turning a blind eye all played a part if the perpetrators of a crime were wealthy, titled whereas everyone else caught the full throw of the law for tiny offences. I loved Evelyn, and poor Clemmy, caught up in a journey she really wasn’t suited for. Evelyn has a spirit of adventure, Clemmy really belongs in a place where she can be indulged, surrounded by luxuries and cosseted hand and foot! Evelyn chafed against the restrictions placed on a young lady of the time and fell into the adventure whole-heartedly, happy to rough it and live so very differently. What I did find hard to take though was that the story was very slow, lacked any real drama in the first 2/3 rds. We’re gradually learning about the mystery of Jacko’s death and the repercussions but the story itself, though so beautifully written didn’t keep me engaged and i did put it aside several times which is unusual for me. I like to read a book in two or preferably one sitting(s).